NEW YORK — Han Xu impressed WNBA coaches and general managers with her play at the FIBA World Championship last fall. Now the young 6-foot-9 star is looking to become the first Chinese player drafted in the WNBA since 1997. "I want to play in the best league in the world," Han said in an interview Monday night, two days before the WNBA draft. "The WNBA is the best, so I want to play in it. I'm feeling very excited to come here." She has been training in the United States for a month in Los Angeles and thinks she can bring a versatile skill set to any WNBA team. 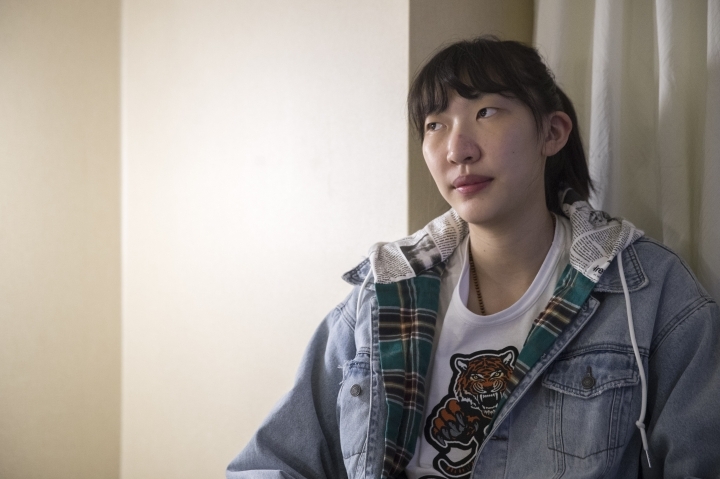 "I'm younger so I can run, and I'm high so I can rebound and I can shoot from everywhere on the court," said Han, who speaks some English but also has a translator to help. Han wouldn't be the first Chinese player drafted to the league if she is selected on Wednesday. The 19-year-old wasn't even born when Zheng Haixia was taken in the second round of the WNBA elite draft in 1997. Back then, the league had three different drafts: one for player allocations, one for professional players who had competed in other leagues, usually international, and one for college players. Han played in the Women's China Basketball Association this past year, losing to a team led by Tina Charles in the first round of the playoffs. Han loves the way that Charles plays and would embrace a chance to play with her. There have been a few Chinese players in the WNBA since Zheng. Sui Feifei and Miao Lijie played a season with the Sacramento Monarchs in 2005, and Chen Nan was with the Sky for a bit. "I hope I can (inspire) more girls to play basketball in China," Han said. She could be the most talented of the group. Han scored 20 points against the U.S. in the world championships. Minnesota coach Cheryl Reeve, who was an assistant for the U.S. team, was impressed with Han and other Chinese players. "I think for sure, I think that the talent is increasing. I think that China is on the verge of having a couple of players in the league that will be a part of teams," she said. "These players work very, very hard. They're very young with some serious upside, and again, just having seen them on the national team, this is a league that I think they could be comfortable in if they get the opportunity." Like many international players, Han may have to miss some time with the WNBA to play with her national team. China's team is playing a few exhibition games against WNBA teams this spring. The Chinese squad is still looking to qualify for the 2020 Olympics.